What Is Garcinia Cambogia, and How Does It Work? 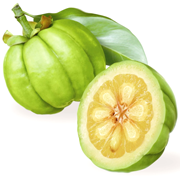 The key ingredient in the Garcinia Cambogia is a very important natural active compound called hydroxycitric acid. Hydroxycitric acid works by inhibiting the release of glucose in the body, while at the same time boosting the metabolism. It looks very much like an undersized pumpkin, green in color and slightly more oval in shape. The active component in garcinia cambogia, hydroxycitric acid (HCA), has been clinically proven to promote positive fat burning and appetite suppressing effects. The natural HCA in Garcinia Cambogia has shown to accelerate the metabolism of subjects in clinical trials and has become an accepted agent of weight loss in the battle to burn excess stored fat with genuinely exciting results. There are no known side effects with natural garcinia. HCA inhibits the citrate lyase enzyme which is known to be an important catalyst in the metabolic process of converting excess carbohydrates into fat. Once this process is inhibited by HCA, the body's natural reaction is to increase carbohydrate oxidation which can result in drastic weight loss. A recent clinical study* followed 135 people who were supplemented with 1600mg of Garcinia Cambogia and strictly monitored for only 3 weeks. On average, the participants lost 19 lbs each. That's 18% of their overall body fat and 12.5% body weight. There were no side effects reported. This is very exciting information and one reason why I think that Garcinia Cambogia is probably the most effective weapon against the obesity epidemic in our country. Perhaps the most surprising part about this study is the fact that the participants were told not to change their diet or daily routine at all. That's right, they lost an average of 19lbs in 3 weeks without exercise or changing your diet. *Preuss HG, Rao CV, Garis R, Bramble JD, Ohia SE, Bagchi M, Bagchi D. An overview of the safety and efficacy of a novel, natural hydroxycitric acid extract (HCA-SX) for weight management. J Med. 2004;35(1-6):33-48. As a Dietary Supplement, take 2 capsules 2 times a day.